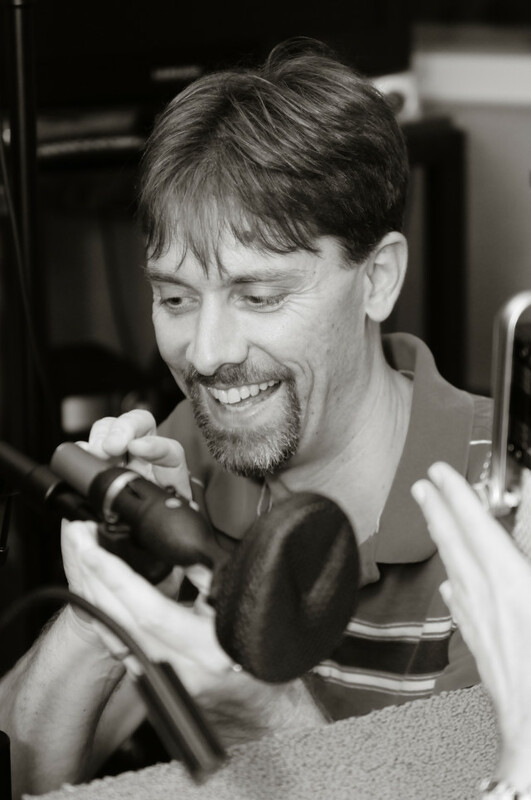 Randy Coppinger has been dealing with voice and microphones for over sixteen years and is currently Dialog Production Supervisor at Disney Publishing Worldwide. He is active on twitter and his blog with studio anecdotes and thoughts concerning asset management, microphones, acoustics, recording and anything else related to audio and voice. In this interview we tackle topics ranging from microphones to voice talent, organisation and quality. DS: Randy, thanks for giving us your time. Let’s start with your background. What got you started? Thanks for asking me. It’s an honor and pleasure to share with you. I was fascinated with my father’s reel-to-reel tape recorder as a child, which seems like the beginning of my love for audio production (I still have the Astatic microphones he used to record his singing quartet). When I was in college I worked at the radio station as a DJ, and eventually a student leader for all of our audio production. I became interested in the people who put the music on the discs we were spinning, which lead to an internship at a recording studio here in Southern California. I started out answering the phone and making coffee in the evenings. Then one fateful evening after all of the sessions ended my mentor, Chris Austin, poked her head around corner and asked me, “Would you help me put the microphones away?” After a few times striking mikes I learned their names and where they were stored. That meant I could also help get microphones for setups. Doing those setups allowed me to learn how each of the engineers positioned microphones for different instruments. I became a full time employee, assisting on sessions and learning from all of these talented people who worked at the studio. Eventually I was engineering my own sessions, and audio post production had become an important revenue stream for the studio including working on some of the early DAWs. DS: ADR and voice overs are often less about the microphone and more about making sure the talent is comfortable and the clients happy. Your thoughts about this? I don’t wish to be ungracious, but I believe that the microphone is *very* important for ADR and voice over. My dialog mixing hero Doc Kane makes a point to use the same microphone that was used when cameras were shooting. He does his research and pulls from his extensive mic cabinet, or will rent, to match the microphone. It is one of the best ways to make ADR match the production audio. When it’s done well, you can’t tell the difference between ADR and production audio. I also believe very strongly that some microphones work better on a particular voice than others. Finding a mic that sounds good on someone’s voice is like selecting microphones for different instruments. Equally important is finding the right placement for the mic, which gets back to your question. The mic choice & placement needs to sound right, but also needs to allow the performer to be comfortable, see the picture, read the script, etc. All of my decisions about how we work together in the studio center on how the technology can serve the creative process. When we become subject to technology, we serve it. That’s backward in my view. I want to use all of the techniques and tools available to stay out of the way so actors can act, and producers and directors don’t have to worry about tech. They hire the recording engineer to worry about the tech! It doesn’t take much for people to be distracted, so I want to cover all of the obvious stuff (microphones, gain structure, sync, being organized) and prepare contingencies to anticipate options people may want so things are flexible and the tech serves the session. From the moment folks walk in the studio door we should be building a rapport and trust with one another. Even simple things like sharp pencils, electrical outlets near the desk for laptops and handheld chargers, a selections of snacks, comfy chairs… all of these little things add up to an intuitive space for getting audio work done. DS: Organisation is critical, with hundreds or thousands of dialogues on some projects. Any tips? I have a love / hate relationship with spreadsheets. On one hand they make a poor database; there are far better choices of software for organizing a lot of cues or assets. On the other hand *everyone* has Excel or some equivalent. So when in doubt, you know you can exchange organized information via spreadsheet. But I may import that data into other software such as Filemaker Pro, or ADR specific software such as EdiPrompt, or VoiceQ. Whichever tools are used, know them well. I make sure to talk with folks about what they will send and what I will deliver. A tech spec is only a beginning. I like to organize the cues so I can jump around easily and organize the recordings I deliver so it is painfully obvious what’s what. I strongly believe in a SMPTE window burn on picture, plus head and tail pops for sync. I can quickly figure out if we’re in sync by simply comparing the window burn to the DAW’s timecode display. I would much rather spend a lot of _my_ time up front getting everything ready prior to the session than waste the time of _many other people_ during the recording session. DS: What would you describe as well recorded dialogue? Do you know what a live bagpipe sounds like? Can you discern the difference between highland pipes and fireside pipes? Many people could not. But everyone who can hear is an expert in what voice sounds like. Pretty much everyone has a voice and listens to other voices every day. When audio practitioners fail to capture and reproduce a voice in a believable way, people know. They may not know the specific technological failures causing it, but poor dialogue isn’t believable. So the long and the short of it is: well recorded dialogue sounds believable. Plosives, sibilance, mouth noise – these can distract us from what’s being said. Appropriate presence, tone, bandwidth, and the like should be considered too. For example, if we see people talking outside but a line of ADR sounds like it was recorded inside, there is a disconnect and we know it’s a fake. Bad lip sync used to be a glaring mistake, though digital TV has forced a kind of public tolerance that upsets my sensibilities. I try to use the technology well to keep the dialog believable. DS: Even professional voice artists have their bad days. What do you do to get the maximum out of a performance? People are going to have the kind of day they are having. We’re not going to magically change someone’s mind or perspective. What separates professionals from amateurs is the ability to work through difficulty. Actors, producers, directors, and engineers… we are all human, yes. We can each do our best under challenging circumstances, but we can also support one another, acknowledge our humanity to one another, and at times even help carry each other’s burdens. Khris Brown is so intentional about recognizing the humanity of everyone in the studio and connecting with them. This gets back to our earlier discussion about building rapport. When actors know you are going to be helpful and supportive – when they know they can trust you – that allows them to rise above. DS: As a recordist, do you find yourself often filling in the shoes of the director (or voice director)? I realize talking with my engineering peers that I am very fortunate in this regard. I have rarely needed to step outside of my recordist role because I’ve worked with such skillful directors, producers, and actors. Those few times when someone sat in the voice director’s chair and wasn’t fulfilling that role, it was painfully obvious. Something as simple as talking to the talent immediately following a take – so the actor isn’t left wondering what’s going on – can be facilitated by an empathetic dialog mixer. We can help keep pace, nonverbally give the actor feedback… all kinds of subtle help can be provided by the recording engineer. I don’t want to interfere with any voice director, regardless their level of expertise, only help out as needed. DS: Headphone mixes and headphone comfort are critical to a good performance. What is your strategy? I learned the value of ditching headphones altogether from Kris Zimmerman. She’s an amazing voice director who generally prefers that actors work without headphones. That kind of “Do What Works” thinking inspires me. On the other hand, actors with a background in radio will often prefer to use headphones and tend to make good use of them. I’ll do whatever works. When I’m recording I always check the mic and headphones (or talkback speaker) before the actor walks into the booth. I set a modest output level on the headphones: a level I would like to have if I were a performer on that mic. When we are setting levels I ask the actor how s/he feels about the level and make adjustments. I like to have a single ear available, as well as a pair of open back and closed headphones. Some actors like it really hot, and closed back headphones are important at high levels to prevent feedback into mic. DS: Do you have a go-to microphone and preamp? Alex U. Case likes to say that recipes in audio remove you from the process. I agree that strategies are more useful. The choice of mic and preamp is based on who is performing, what they’re performing, and the larger context of the project. For example, I was privileged to work on a project featuring the voice of Pinocchio. Of course the original actor was out of the question, and children’s roles have to be recast when they grow out of their voice. But the microphone technology used by the film studio in the late 1930s did not include my Neumann TLM-170. That mic is _never_ going to sound right on that voice. Fortunately Wes Dooley and all of the fine folks at AEA have kept quality ribbon mic technology available so we could keep the sonic integrity of Pinocchio’s voice. In order to use a wide variety of microphones, a high quality mic preamp is important to me. I like to have something with lots of clean gain, and then a few other options with some sonic flavor. Some microphones behave differently depending on the preamp topology, so options are good for bringing out the desired qualities in a person’s voice. DS: Are you a purist or do you do some amount of processing while recording (filters or compression)? My mentors recorded to analog tape. While the various tape machines and tape brands had their own sound to them, the art of recording to tape included shaping the sound before it got to the recorder. We attribute so much of the “analog sound” to the technology, but I think the techniques used to optimize that technology were just as important. Every piece of gear has a sound to it, including a microphone. If I can make good choices about mic selection and placement, I will need to do less processing after the mic to get things sounding good. But in the same way I may swap out one mic for another to address an overly nasal or chesty sound, I’ll use EQ, compression, or any other sonic tool necessary to “print” a good sounding voice. I don’t want to do anything drastic that ties the hands of people downstream, so these tools must be used judiciously for sure. But I am too passionate about recording a great sounding voice to miss opportunities to make it sound great in the interest of being a purist. It may also be worth noting that location recordists are choosing mikes, placing mikes, using rolloffs, using compressors, and using limiters too. So if anyone is in the business of making ADR sonically “fit” with the production audio, purism could be counterproductive. DS: Advice for any audio fledgelings interested in recording, editing and mixing voice? Don’t be afraid to move the mic. Even if actors, directors, or producers find it odd, run out there and move the mic if it needs to be somewhere else. Constantly listen to the relationships between your tools, techniques, and sonics. Always listen. When in doubt, be in record. You can always delete something, but you can’t use a rehearsal take if you don’t record it. Avoid gossip. Don’t post out takes or pics/video you took without permission. Confidence and trust must be earned and are _so_ difficult to earn back if you violate them. Doc Kane says he likes to have a conversation with actors _before_ they get in the booth, partially to build rapport, but partially to hear what the actor’s voice sounds like right in front of him. Then he compares how that voice sounds on mic. This can lead to choosing a different mic, moving the mic, applying EQ or compression, etc. I’ve noticed that short actors often comment if I lower the mic when we’re setting up. So I like to keep the mic low and raise it when the actor gets in the booth. It’s a subtle, simple thing but it helps avoid unnecessarily drawing attention to a person’s insecurity. Work smart and work hard. Be the kind of recording engineer people like to work with and want to hire. If you love your work, people can tell. If you’re annoyed with someone or something in your studio, find something else in that session to focus on instead. You can’t ignore problems, but if you just wallow in your disgust for a situation, it shows. Keep your ears and mind on the joy of your work. Great read, I will definitely use these techniques for my school project where I’m doing ADR and dialog editing some terrible on location dialog.